Back before I had kids and I was a single lady, I would go to Walmart or other places and see kids screaming and I would give total side eye to the moms. "Get control of you child!" is what would be in my brain. I totally judged all moms when their kids weren't behaving. And I was humbled and gained a ton of empathy. I'm thankful for that. 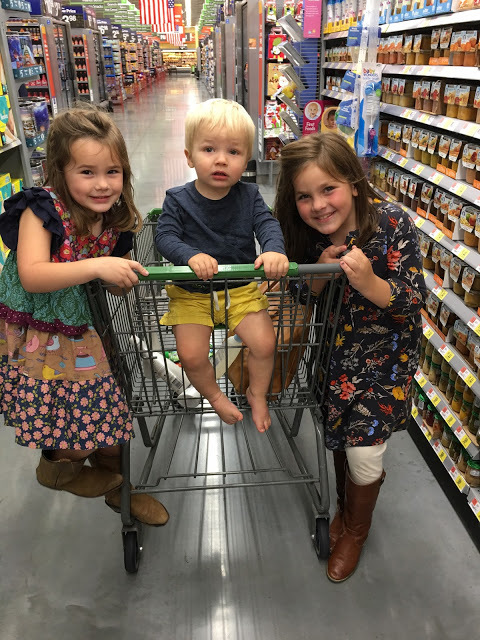 Now I'm a mom of three and one very, very busy toddler who hates shopping carts. I try to go to the store when they are all in school but I also have to pack a ton of stuff in those hours and it happens that to make the best use of my time, we need to all go to the store after school. I also try to go at night but now that we are in school and activities - by the time everyone is in bed, I'm too tired to go. And I could do grocery pick up and I do but that involves planning ahead and sometimes it's the last minute trip after school for lunch supplies and dinner! All that to say I'm often at Walmart with all three kids. My girls are well behaved and helpful. Will Holden has good days and then he has days where he won't sit down or he's yelling. It's stressful. I try to make the trips as quick as possible for the sake of everyone involved. But I can't tell you lately how often I have received ugly looks from older people. I want to say "did you not have children?" " Do you not remember?". I just wish they could offer a simple smile and a little encouragement. It would go so far. Frowns and rolled eyes are not helpful. I still remember the day that Harper was around a year old and having a bad day at Walmart. She was throwing out goldfish everywhere and then dumped a whole package out. I was on the floor on my hands and knees picking up goldfish and wanting to cry. This precious woman stopped me and offered the kindest words of encouragement. I don't even remember what she said and she probably doesn't even remember this happening - but this simple gesture meant the world to a struggling mom. I'm willing myself to remember when my kids are grown how hard these young years are. I may even buy a bunch of Sonic cards to stick in my purse to hand out when I see that struggling mom with an unhappy toddler. Or at the very least smile and say "hang in there". I brought this subject up on my instastory the other day and was met with hundreds of DM's from people who agreed with me. Tons of moms who experienced this daily - it isn't just me! Life would be a lot better if we all just encouraged each other. And not just in the grocery store. And not just moms with toddlers. Just put ourselves in others shoes and walk around a bit. (and maybe I should smile and try to encourage the grumpy older people. Putting myself in their shoes - maybe they are just having a bad day.) See what I did there? Trying to give grace.